10th – 11th September 2016 saw the British Roller Derby Championships playoffs for Tiers 2 and 3 women and Tier 3 men, and our Belles were excited to be taking part after a fantastic year. Winning the first game meant guaranteed promotion; losing meant the games were over for the weekend. Strong jamming, disruptive offence and some heavy hitting saw Wirral Roller Derby take an early lead. Wirral came out fighting, playing stronger and smarter. Despite strong walls from the Belles, the half time the score was Wirral 129 – 39 Hell’s Belles. The Belles kept their heads, readjusted tactics and came back with a vengeance in the second half. Points were hard fought but it wasn’t enough. Final score was Wirral 199 – 105 Hell’s Belles. Despite the loss, making it to playoffs was the icing on the wonderful cake of a season the Belles have had. And we do like cake. 🙂 Helmets off to Wirral Roller Derby, we’ve definitely learned a few things that we can take away. The rest of the weekend saw game after game of incredible UK roller derby. Our hearty congratulations to the teams that took the top spots – Birmingham Blitz Dames, Swansea City Roller Derby and Suffolk Roller Derby – all thoroughly deserved. The British Roller Derby Championships has just finished its second year, which saw 66 women’s leagues and 20 men’s leagues competing across the country. 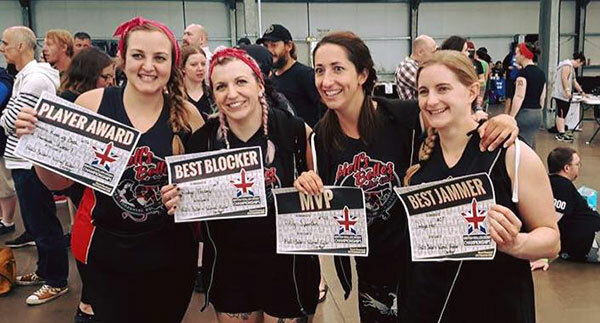 There is no doubt that this tournament, which facilitates competitive play for leagues across the country, is helping to support the growth of roller derby in the UK. This massive undertaking has not gone unnoticed and our league would like to say a special thank you to the core of volunteers who must spend a significant number hours, organising and developing this fantastic tournament. A HUGE thank you to everyone who came up to support the Belles and the event by cheering, crewing or NSOing, to our coaches for getting the Belles to playoffs, to all of our individual skaters who challenge us to be better and make our league stronger, to British Champs for putting on a spectacular two-day event on top of a fantastic year, to Derby Duck Productions for providing live stream for our friends and families all over the world, all the officials, medics, stallholders and other wonderful people that make the magic happen. Derby love and shoves to you all.